How did advertising-driven broadcasting establish itself as the dominant user of the airwaves in America? 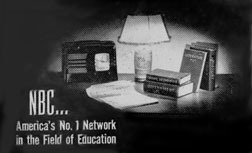 That was still NBC’s claim in a 1945 advertisement aimed at educators and still plugging the NBC University of the Air. A crucial episode occurred in the 1930s when commercial broadcasters argued successfully that they would put education on the air, and educators should stick to their books. Eugene E. Leach, Ph.D., a professor of history and American studies at Connecticut’s Trinity College, tells the story, originally serialized in Current. This paper by Eugene E. Leach, Ph.D., was originally serialized in Current during January, February and March 1983 under the title, “Snookered 50 Years Ago.” Leach is a professor of history and American studies at Trinity College, Hartford, Conn. He earned his doctorate at Yale University in 1977 and specializes in the cultural and intellectual history of the 19th century, working-class history and multiculturalism. Email. My understanding of the early evolution of educational broadcasting has been molded by the publications of many able historians: Erik Barnouw (A History of Broadcasting in the United States, three volumes, 1966-70); Robert J. Blakely (To Serve the Public Interest: Educational Broadcasting in the United States, 1979); George H. Gibson (Public Broadcasting: The Role of the Federal Government, 1977); Frank Ernest Hill (Listen and Learn: Fifteen Years of Adult Education on the Air, 1937, and Tune In for Education: Eleven Years of Education by Radio, 1942); Harold E. Hill (NAEB History, Volume 1, 1954); and John Walker Powell (Channels of Learning: The Story of Educational Television, 1962). The famed 1950s foundation-subsidized TV show Omnibus and the Bell Telephone Hour programs on Shakespeare and science, hosted by Frank Baxter, were late instances of Cooperation on the commercial networks. Here’s a comment without logging in.